The seeder is a basic component of Direct Planting system. They can be very varied and the capable to adapt to different situations and agro-ecological regions and enviroments all the over the world. According to the enviroment or ecological region where it is necessary to plan, the set up of the planter is specially made for its optimal perfomance. Field seeded after 20 years of permanent pasture. 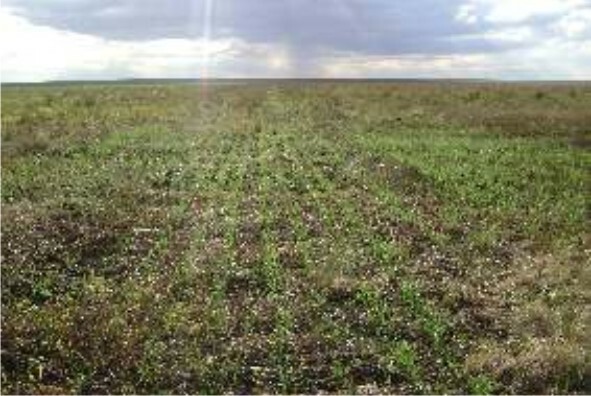 The picture shows soybean planted with 30 degrees cross from last wheat crop. The first thing to note is that planting should always be on a diagonal to the previous planted crop, this practice is for the soil not to get used to the same way of work and thus achieve a better implantation of the crop. 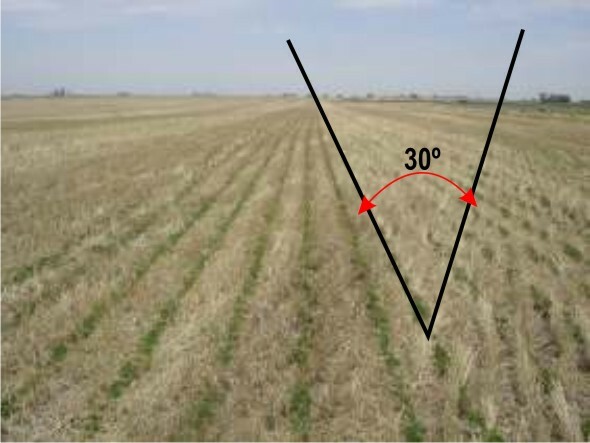 You must cross 30 degrees from the previous planting to avoid tyre tracks, crop residue and fertilizer banding. The basic principle of planting is cut, removal and cleaning of the place where the seed is deposited. In Direct Planting machines, the planting body is the heart of the machine and must fulfill the following requirements: To cut in efficient way the stubble; To prepare a small band with superficial removal of 3 cm wide by 10 cm of depth, where finally the seed will lodge and to place the seed with equidistance of distribution and uniformity in the depth. Once the planting disc deposited the seed, the main task in to place the seed at the bottom of the furrow in order to get a good soil/seed contact that allows us to have a high percentage of emergence and uniformity. For that we have two devices the pressing wheels and the plastics tails. As basic principle of construction for the pressing wheels is that they must have the largest diameter and the smallest width possible, as it requires low speed and tight on the seed and not on the sides of the furrow section. It is clear that the wheel system is not recommended for high humidity and heavy clay soils conditions. The plastic tail in general has showed a better performance in situations where we have wet and adhesives soils during planting time. The plastic tail should not be placed far from where the seed falls because if the walls of the furrow collapse the pressure made by the tail would be pitiful and their work will be useless. The closure of the furrow is a task that becomes more important as weather conditions are more severe, regarding evaporation, and also the task becomes more difficult as we have more clay and wet soils. While covering the seed the idea is to place loose soil as an inverted V with the smallest amount of air chambers as possible. In that way we will be breaking the capillarity in soil therefore reducing water loses. Now if we want to talk about how precise are the planting machines we have a lot of ways to measure it. For example we can look at a maize crop, because this crop is very sensible to failures during planting and one seed of maize has a lot of technology invested in it. That’s why in USA a bag of 80.000 seeds of maize costs around 300 dollars. So for been such an expensive input at Purdue University many studies were conducted regarding the loss of yield when we make poor planting quality. The uneven spacing of maize plants produces a yield reductions ranging from 450 to 950 kg per hectare. This is measured by standard deviation (s) which tells us that for each centimeter of increase in the deviations, 62 kg of maize per hectare are loss from potential yield. A specialized company in precision farming has recently developed another formula tomeasure the reduction of maize yield potential for failure and poor distribution during planting. The operating principle of the formula is the following= We have a yield potential of 10000 kg per hectare with 75000 plants. Each plant will give me an ear so if you divide the potential yield it will give a weight of 0.133 kg per ear.